The baseball and football cards found in this recently acquired collection elicits the loudest of cheers from the collector in me. There just aren't enough adjectives to do them justice - they are that good! “Gorgeous," “beautiful,” and “incredible” will have to suffice for now in describing the plethora of vintage Bowman, Topps and Fleer sets hailing from the Tar Heel state. One of our card specialists, Scott Alpaugh, returned to the office this week with a high quality abundance of cards from a collection amassed by a retiree, who relocated to the Appalachian region from California. This collector, assembling this large, four decade run of sets, put the collection together with pride and passion. He had a love of sports, and added his cards to a remarkable “library” of sports and other autographs he personally obtained in person. Many of these signatures were secured at the NFL’s Pro Bowl and regular season games at the Los Angeles Memorial Coliseum, along with other venues throughout the area. Just Collect was asked to travel to the collector’s residence to see the collection. Scott's trip resulted in “gains” for both Just Collect and the husband-and-wife team selling the collection. The gains go beyond just the scope of the business transaction which took place. Our review and complete evaluation of this large collection, demonstrated our expertise, thoroughness, and efficiency to appraise the content and condition of the cards, unparalleled by any other firm. The seller certainly gained a great price, but more than that, gained the appreciation of trust and respect that expertise, fair treatment and professionalism that Scott exhibited in the 2-day long process required for this exchange. This collection includes runs of vintage sets, ranging from 1950 to 1980 from all of the major card manufacturers. Bowman, Topps and Fleer are well represented, as are the majority of diamond and gridiron Hall of Famers, stars and favorite players spanning those decades. The condition, overall, is truly phenomenal. 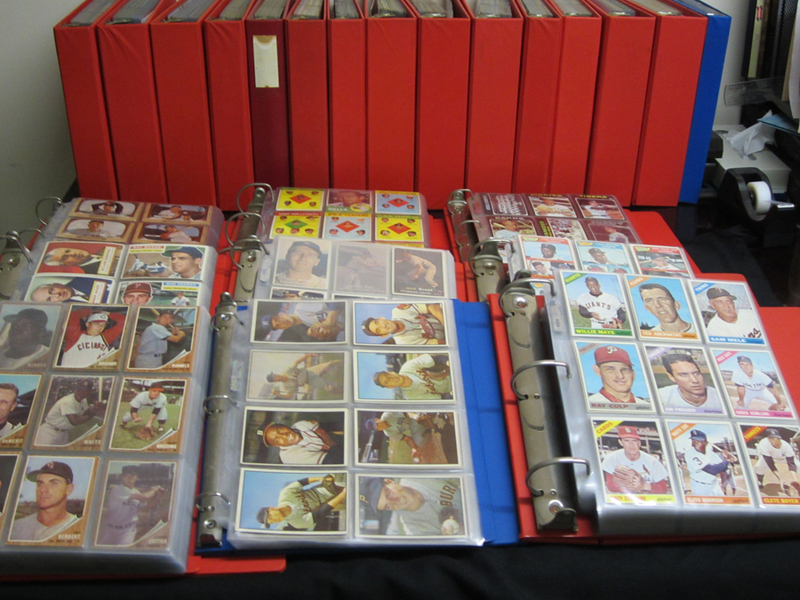 The baseball cards contained in this amazing collection are from Topps and Bowman. From Bowman, the group includes a complete 1953 Color baseball set and a complete 1955 “Television” baseball set. Topps is represented from 1956 through 1982, and while not inclusive of every year in that span, there are twenty three partial, near and complete sets from those eras. The football sets come from all three major card makers, Bowman, Fleer and Topps, and feature NFL stars and legends, as well as those luminaries from the fledgling American Football League. Mantle, Mays, Clemente, Gibson and the Duke (Snider), along with the very first New York Mets, Houston Colt .45s, Minnesota Twins, Expos, Padres, Royals and Pilots… they’re all here in a baseball bundle put together over the years by a collector who definitely loved the hobby. Football rookies, such as Johnny Unitas, Bart Starr, Gale Sayers, and so many other Hall of Fame members, abound in this wonderful collection of the Golden Age and Early Modern eras of card collecting. Few of the cards in the sets are in less than Excellent condition, with most in the “EX-NM” category, and several up there in true Mint shape. Glistening colors, minimal wear, sharp corners, and great centering, attest to the seller’s appreciation of including high quality cards in his collection. This seller began assembling his cards while in his youth, and continued his hobby throughout his adulthood. He truly had a eye for condition some forty years prior to professional third-party grading agencies were even thought of. There were no grading companies in the 1950's, 1960's 1970's, or 1980's. "Condition" did exist during the era this collection was built, although somewhat subjective, it featured the "Poor/Good/VeryGood/Excellent/Mint" format prominent until professional grading debuted. Under this system, a Mint card exhibited four sharp corners, no wear, etc., but could be off-center and still rate a Mint grade. Professional grading fine-tuned guidelines, pinpointing measurements of baseball, sports and trading cards. As mentioned, the seller put these sets together over many years, beginning in the 1950's and purchased many from some of the pioneers of sports card dealer fame. One such “pioneer” was the late Goodwin “Goody” Goldfaden, owner of the Adco Sports Exchange. Upon his passing in January 2012, the LOS ANGELES TIMES reported that Goldfaden "... is considered the creator of the hobby of sports collectibles and probably the longest active dealer..." Goldfaden began stocking up on sports publications and cards with his brother in the 1920’s, used ads in various periodicals to sell sports items beginning in the 1930's, and initiated the sports exchange "store" in West Hollywood in the late '40's. This California-Carolina collector also purchased cards in-person at many of California's great card shops, as well as the “old school” mail order method from many major advertising dealers. Additionally, he found complete sets available through such dealers as Renata Galasso and others, who followed Goldfaden's lead in placing ads in baseball card journals and major sports annuals of the day beginning in the 1970's. Even though Scott flew down to see this tremendous assortment of baseball and football cards, this collection was just too large and condition-sensitive to be safely transported back the way he came. So, Scott drove 600 miles through the night, to safely transport this collection back to the office in NJ! Much as the seller gained an appreciation for what we must “invest” in finding, reviewing, assaying and evaluating a collection of vintage cards, Just Collect customers will be equally appreciative of the opportunity to own a few of these cards in our upcoming auctions. The seller's keen detection for high grade, high quality cards from over four decades is reflected in this coast-to-coast collection. Interested buyers of these treasures will recognize the seller's talented "eye for condition", and will want to add many of these cards to their own collections. We are always looking to buy vintage singles, sets and collections like this one, and are hoping to come across some more in the near future! We have created a buying list for you, which outlines each set and what we are willing to pay for it - based on condition. We will be adding dozens more sets to this list, so keep checking back!